Fifteen former inmates have won a legal battle over claims they were mistreated and discriminated against on racial and religious grounds at Leeds prison. The claims against the Ministry of Justice included complaints by Muslim prisoners who said they had been given contaminated halal food. Some of the prisoners also claimed they had been assaulted by prison staff and other inmates. A settlement was reached on Thursday in a trial at Leeds County Court. Thirteen of the prisoners claimed they had been discriminated against on the grounds of race and religion, with some claiming they had been racially harassed and victimised. Of the 13, seven claimed they had been assaulted by prison staff and two accused staff of negligently failing to protect them from alleged assaults by other prisoners. The remaining two inmates brought claims for alleged assaults by prison officers. 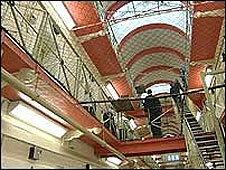 Leeds Prison holds more than 1,200 male prisoners, of which more than 200 are Muslim. A solicitor for the men said the claims, which referred to incidents between 2003 and 2005, were brought after a number of prisoners signed a petition to complain about discrimination and racism in the prison. Kate Maynard, a solicitor with Hickman and Rose Solicitors, said the racial discrimination claims involved complaints about halal food being contaminated and the lack of Muslim prisoners being involved in the food production process. Complaints were also made about the lack of access to facilities on the grounds of race or religion and a lack of access to interpreters for non-English-speaking prisoners. Ms Maynard said the alleged assaults on prisoners by prison staff were "fairly minor assaults" but said the two prisoners who claimed they had been assaulted by other inmates were left with "lasting injuries" as a result. "The custodians have almost facilitated the assault if they have failed to protect them from someone they knew was dangerous." She added that she could not disclose any of the terms or details of the settlement but said her clients were pleased with the outcome. "They hope that bringing their complaints to court has been a catalyst for change in the treatment of non-white prisoners at HMP Leeds, so that the experience of non-white prisoners in HMP Leeds is now better than theirs was three-to-five years ago." The prisoners involved are no longer in custody at HMP Leeds, having either been released or transferred to other prisons. A Ministry of Justice spokesman said the agreement to settle was reached by all parties involved in the case. He said: "The Ministry of Justice has settled 15 claims brought by prisoners who alleged that they had been subjected to unfair racial treatment whilst in Leeds prison. The terms of that settlement are strictly confidential. "The Ministry of Justice did not take lightly the decision to settle these claims and did so only on strong legal advice."